We are pleased to introduce ourselves as a Manufacturers and suppliers of Plastic Processing Machinery and Material Handling systems. And Storage solutions based in Ahmedabad, Gujarat, India. RCV Engineering is one of the leading heavy fabrication and machinery job specialist having vast industrial experience serving various types of engineering companies since 5- years. 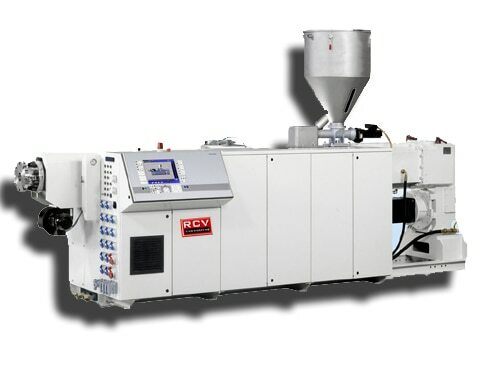 Its our pleasure to inform you that RCV Engineering has expanded its business and started manufacturing of Plastic Processing Machinery. Our product range includes Single / Twin Screw Extrusion Plant suitable to produce RPVC, uPVC, CPVC, PPR & HDPE pipes - widely use in various applications like Conduit, Drinking Water, Agriculture / Irrigation, Infrastructure, Industries etc...., Material Handling systems like Vacuum conveying systems , screw conveyors and Storage solutions like Storage silos etc. RCV Engineering India Private Limited offers you Vacuum sizing tanks for PVC Pipe Production Line. » Intensive cooling provided to ensure high production ratio » Easy cleaning bayonet type spray nozzle provided » Accurate vacuum control, water level control & temperature control provided » Additional vacuum chamber and motorized axial movement provided from VST-250 and above for quick startup and less wastage » Manual slide rail arrangement for Axial and transverse movement of the tank » Dual vacuum spray tanks on common frame for dual pipe extrusion line » Imported filters for online cleaning » Air operated solenoid valves optionally » Cyclone separator for vacuum pump optionally Vacuum Sizing Tank - manufacturers, exporters & suppliers of Vacuum Tank, Twin Vacuum Sizing Tank, Plastic Vacuum Sizing Tank in India.